Dulcet sent this one from 1896. Ashley found this one from Alexander McQueen, although it will set you back more than £900 (!). The sharp-eyed Helen saw this one on Etsy. The pattern calls it an "attached capelet," but she said she wasn't fooled: it's a fauxlero. Elle sends this fantastic vintage Burda … a wraplero! 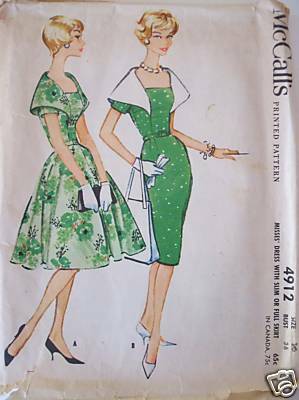 And, as a reminder, the fabulous Jenny started at category page on the Vintage Pattern Wiki for fauxleros here. Add yours! And more sales! Lisa is having a fall sale at the Vintage Fashion Library. 15% off, using keyword fabulousfall, good through the 15th of October, and Sandritocat is having a one-day sale, 20% off everything (before shipping) tomorrow, Wednesday the 8th. McCall 4912: I go for cape. My mother had that dress, and she was fascinated by capes all of her life. Love the Burda! How elegant and simple. McCalls 7882 is not really fauxlero, it more of a vest effect. Love the chest pockets. Oh, Erin, I am so coveting the wraplero! Comment on McCalls 4373:Yes, the drawings from that era are detestable. As a young girl trying to find a suitable pattern I was always put off by them. Legs three times the size of their bodies…Just gross. 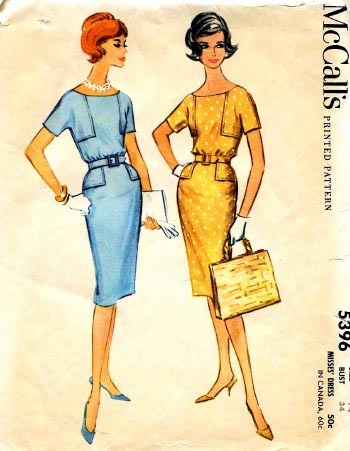 I think McCall’s 4912 has what my 93 year old mother calls a Bertha collar. 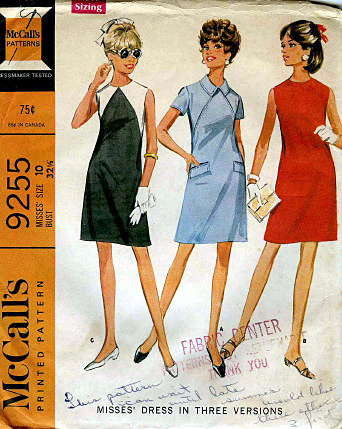 McCall’s 4912 looks like the love child of a fauxlero and a sailor collar. That Alexander McQueen dress is to die for! Does anyone know of a pattern similar to it? Heaven knows I can’t afford the original…. The third one, McCall’s 8666 (note the sign of the DEVIL! ), is strangely hypnotic. I’ve always understood one mark of good taste to be that all features on a garment should be functional. Sort of a Puritan esthetic; No false buttons, no false pockets, NO FALSE MOVES. And yet I find myself horrifyingly drawn to this design! What could be cuter, or cooler on a warm day, than this fashion fake-out of a faux jacket over a faux sheath (note it’s actually a “2-piece dress”, another blot of suspicious fakery.) I see someone wearing this outfit to interview as a bank teller, or maybe to an uptight parent/teacher conference. WHY DO I LOVE IT SO??? And who will save me from it?! Pray for me!!! I have the Gloria Swanson one and always thought of that as fauxlero, but forgot to mention it. I think I have the McCall 9255 as well. Some of them can be kinda neat, but some are too strange. “Alexander McQueen has thrown up yet another designer piece that’s steeped in vintage inspiration.”Well why did he have to eat it in the first place? 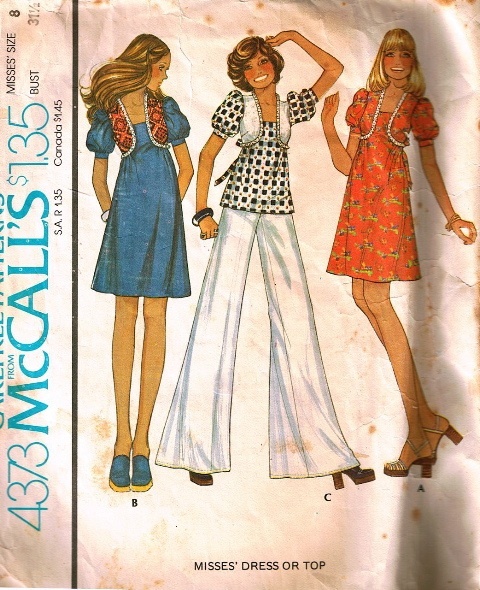 I’m actually smitten with that 70s tunic, crazed grin notwithstanding. Love!But some of these patterns I’m really having to squint and peer sideways at to acknowledge them as fauxlero styles . .
some of these patterns Im really having to squint and peer sideways at to acknowledge them as fauxlero styles… The ways of the evil fauxlero are mysterious and cunning. You’re right, they can be subtle. And they are ALL AROUND US!Examine all clothes and patterns purchased carefully. I must know: How can a “dress” be two pieces? I thought a dress implied one piece only? I want an answer to this, too…because it’s a major gyp! (Hope that’s not an insulting term to any gypsies reading this.) But there IS such a thing as a “2 piece dress”, crazy as that sounds. No one seems to be able to quite define what one is, however. Basically, it seems to be a top and a skirt that LOOKS like a dress, because they match, but they’re not really an actual dress. OUTRAGEOUS! Could it be “Magic Lady” because it looks like something Samantha from Bewitched would wear? As the only man (ostensibly) on this comment board, I can only say those fauxleros are deconstructed. Deconstructed as hell. They’re the Albert Ayler of fauxleros. I LOVE 7011!Actually, the fauxlero goes back at least to the 1860’s. Zouave jackets were popular for young women during the Civil War, but some day dresses imitated the look with just two curving lines of braid running from the shoulder downward, and curving backwards above the waist. 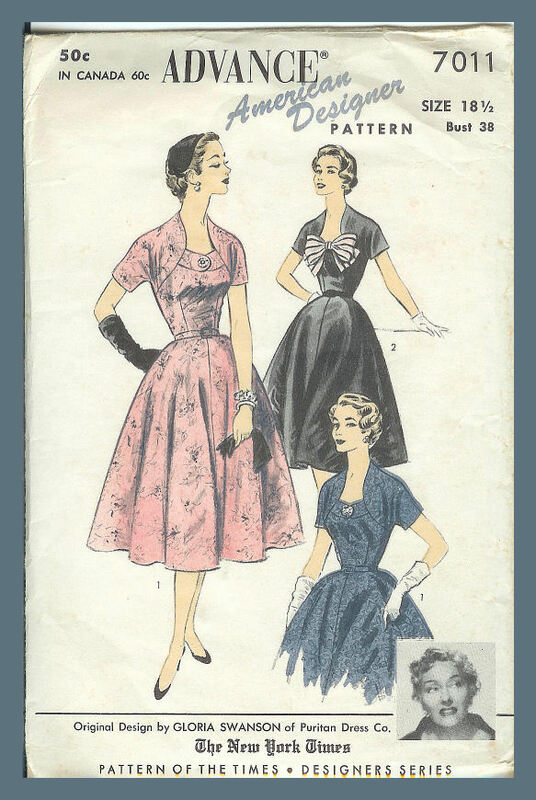 Simplicity 3791 does that look pretty well (sorry, but this is a clearer picture than any of the period ones I could find). Hey fauxlero lovahs.. don’t forget I’m using that as a searchable keyword on the site now at http://www.momspatterns.com! I have a few from the 70s.. that decade REALLY seemed to love that look, didn’t they?Cookie. Duly praying for you but just GO BUY IT! No, don’t. Yes, DO! I’m no help. Pssh. Cookie is 8666 were in my size I would buy it and save your from it. honestly I love them all, but not equally. Thank you all for your prayers. Devil Dress 8666 is not my size, either, but I keep thinking of new places to wear it. I see Easter Bonnet! 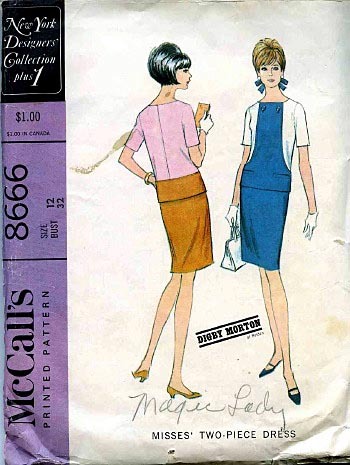 The designer of McCall 7882 had seen too much of Will and Betty Rogers in those cowboy get-ups and set out to design a sophisticated dress for Betty.McCalls 4912 is for the femme fatale in training. 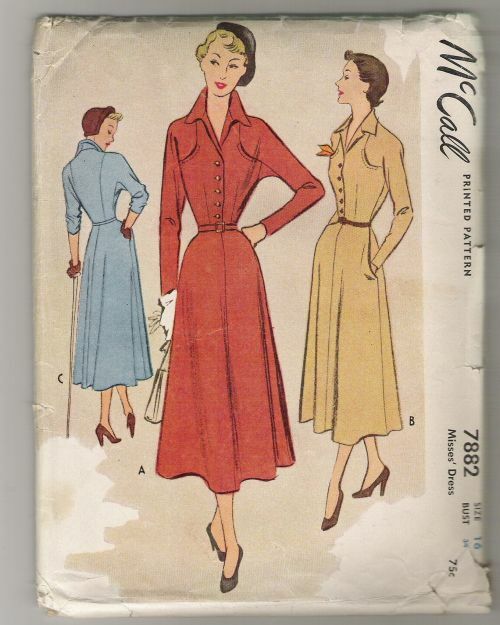 The full fledged cape must be earned…I believe that McCall’s 8666 was a home-ec project dress and that the project owner wrote this nicknake she aspired to on the pattern, hoping it would stick.Actually, I think the Burda is a fauxmono; the evil love child of a dress and a kimono. Oops! that’s me ^, not my husband! 4912 is for the femme fatale in training. The full fledged cape must be earned If this were in heavy white satin and had a big, full skirt, I can see Kim Basinger or someone whose taste is just a little wacky wearing it to the Oscars. One of those Close, But No Cigar type outfits. That would be good! The Oscars could use a tad more wacky. I kinda miss the days of Angelina showing up as a vampiress. All these old drawings are so cool! I understand that the garments with features that look like they’re going to be capes but turn out not to be capes are made in Cape Disappointment, Washington.